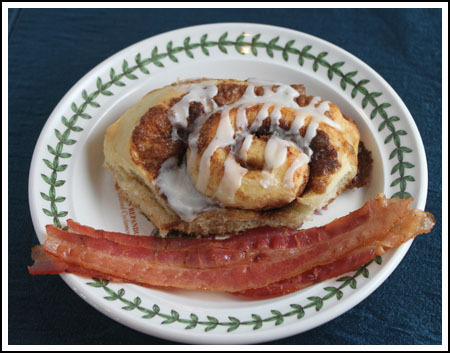 If you love cinnamon rolls but dread waking up early to make the dough, this one’s for you! These make ahead cinnamon rolls are so good that Domino Sugar put the recipe on the back of their box. This recipe is fairly convenient, not only because it can be made ahead, but because the dough requires only 2 minutes of kneading. After a quick knead, you just stick the dough in the refrigerator and let it rise overnight. When you wake up, the only thing left is the fun part — filling and shaping the rolls. Beat eggs in medium size bowl. Add 3/4 cup warm water and yeast, stirring to dissolve yeast. Refrigerate mixture for 10 minutes – I believe the purpose of refrigerating is to make sure the liquid is not too warm to melt the butter when you add it to the flour/cold butter mixture. In a large bowl mix the flour, salt and sugar. With a pastry blender or fork, blend in butter, until it resembles coarse crumbs. Make a well in the center and pour in the yeast mixture. Gradually blend the mixtures together; it will be loose and a little sticky. Gather dough onto a floured surface and knead until smooth, about 2 minutes. Form dough into a ball and place in lightly greased bowl and cover with plastic wrap. Chill for at least 2 hours, or overnight. When ready to bake, roll dough into an oblong shape (I made a rectangle of which was about 12 by 14) on a well-floured surface, about 1/4 inch thick. In a bowl, mix together the brown sugar and cinnamon. Brush the dough with melted butter and sprinkle with the sugar mixture, leaving a 1-inch border. Roll the dough up to form a jelly roll. With a serrated knife, cut the roll into 1-inch slices. Place on a greased baking sheet and allow to rise in a warm place about 30 minutes. Generously sprinkle with the granulated sugar (I skipped this step). Bake in a preheated 350°F oven for 25-30 minutes. Allow rolls to cool slightly on wire racks placed over wax paper. To make Icing, mix the melted butter confectioners’ sugar and milk together until smooth. Drizzle icing over rolls and serve. Rolls can be wrapped in aluminum foil and individually frozen. To serve, heat in a pre-heated 350°F oven 5 minutes. You can freeze the spirals of dough. Just cut the jelly roll into rounds, arrange however many you need for the occasion, then put the remaining dough in the freezer to solidify. When dough spirals are firm, put them in an air-tight freezer bag. The next time you want to make cinnamon rolls, arrange the frozen dough spirals in the pan the night before, let them rise overnight, then wake up and bake. Kim, thanks! Yes, moving was stressful. On top of that we had to deal with some criminal activity at the apartment complex which wasn’t very pleasant. Shannon, I was hoping someone else who saw the recipe on the Domino box might appreciate the review. LOL. I kept seeing the recipe and wondering how the rolls were. again, noticed this recipe on the back. Every time I have a box, I look at this recipe and wonder how good it is, but have never tried making it. Now that I have some feedback on it, I think I might give it a try. Your life sure sounded hectic over the past several months. Glad to hear you are enjoying your new home. I’ve always heard the Texas hill country is really beautiful. I love the freezer tip for the cinnamon rolls. Yum! Glad you are setteling into your new home. Sounds like everyone has their personal space as well as the common areas. It takes time to get setteled but I am sure that you will do it in half the time as most. I love the tip about freezing the spirals! I’ve frozen the dough before, but then have to wait for it to come to room temp to roll it, fill it, cut it, wait while it rises again…It still requires getting up early if you want breakfast before noon. Do you let your frozen rolls rise over night in the fridge or on the counter? You sound really pleased with your new home. I’m very happy for you and your family! The smell of cinnamon rolls must have been a really nice way for the rest of your family to wake up! They look marvelous, so glad you are settling in and happy!